I have not done an online doll class in a couple of years. My apologies to my doll friends! 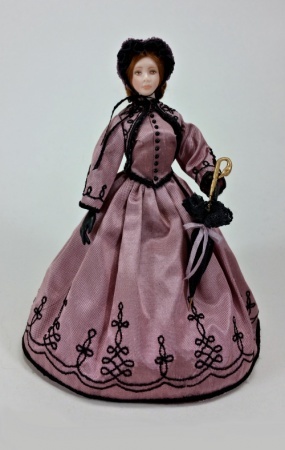 I have recently become involved with a wonderful new doll from the 1860's and suddenly find myself fascinated with the fashion from that era. All those loops and curls of soutache and those darling little fanchon hats! When I decided it was past time for a doll class, I wanted to see if I could capture that era in miniature, complete with all those loops and swirls. Elizabeth is the end result. 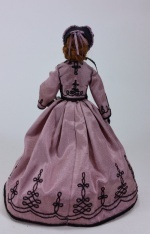 She is costumed in a beautiful mauve silk fabric. Her walking suit is comprised of three pieces, a very full skirt, a vest and a zoave jacket. ( a zoave jacket is a very short, open front jacket with wide bottom sleeves, usually very ornately decorated in soutache or embroidery). Rather than have you spend 6 months hand embroidering the designs on these tiny pieces, I have copied and digitized a historical braiding pattern and added it to the bottom of the skirt and around the jacket. Be sure to look at the photo of the back of the jacket... is is prettier than the front! There is no sewing required except for gathering the skirt, petticoat and sleeves. No hemming, as you will simply trim the fabric away from the satin stitch at each hemline. This is a very impressive costume that is VERY easy to complete. Even a beginner will be able to complete this with wonderful results. Students will assemble the prepainted porcelain pieces, create undergarments, including a wonderful petticoat made from antique cotton petticoat netting and french lace, and make the costume and hat. They will also create the wig from viscose fiber. The hat is a historically accurate little bonnet called a fanchon. 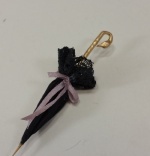 Ours is made from black silk and trimmed with black lace and silk ribbons. The finishing touch is the parasol, with it's darling swan head handle that we have 3D printed especially for this project. I have purchased all of this gorgeous silk that was available to me, so I will have to limit the size of the class to available fabric. If you have any questions, don't hesitate to drop me an email! Thank you for looking!